THIS MONTH, let's revisit the break shot. Back in September '08, I detailed the importance of accuracy on the break. Before you even think about upping the power of your shot, you need to be able to hit a simple stop shot. With the 1 ball on the foot spot and the cue ball at any point on the head string, work on hitting the center of the object ball with the center of the cue ball. Moving only your arm, try to consistently hit a stop shot. This is not an easy task if you've never tried, believe me. But learning an accurate break, which in turn leads to a controlled cue ball, then allows you to focus on putting more power behind the shot. 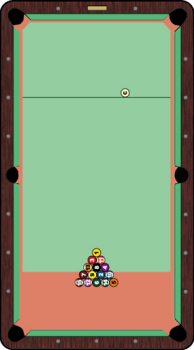 Often, a player tries to throw his whole body into the shot, all before knowing how to make the cue ball sit in the middle of the table. When you've mastered the arm-only version of the break, then - and only then - are you ready to incorporate a little bit of body movement. First, study how far you can follow through when you move only your back arm. You'll notice the cue tip will reach, at the most, two feet past the cue ball. Then, with your cue fully extended forward, lift up your back leg and slowly shift your body forward. You will notice that cue stick will suddenly reach farther - almost to the center of the table. The key is incorporating this type of body movement, while still placing a premium on an accurate, controlled stroke. Start with a small shift of your weight forward as you hit the cue ball. If you are still hitting the center of the object ball with the center of the object ball, add a little more body movement. But remember, you can only incorporate more of a weight transfer when you're able to consistently control the cue ball. You can even play a game to track your progress. Every time the cue ball hits a rail, rolls forward toward the bottom rail or scratches (the red zones in the diagram), give your "opponent" a point. If you hit the rack and the cue ball sits in the middle of the table without hiting a rail, you get one point. You'll be on your way to an powerfully accurate break when you can win a race to 10. // LAST MONTH we discussed the first step toward incorporating body movement into your break. Once you feel confident hitting the center of the head ball with the center of the cue ball moving only your back arm, you are ready to experiment with a few movements that might up your power. Before we start, though, it is absolutely imperative that you continue to control the cue ball on your break. A thundering break is useless if you can't control it. So if you ever begin to lose accuracy, slow down and make sure any new movements are not knocking you off line. Once you are locked in with the arm-only break, there are several ways to throw your body - which one you prefer is more of a personal preference than one being "right" and one being "wrong." 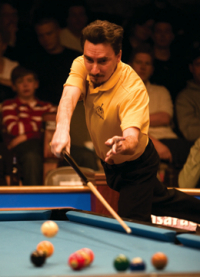 Johnny Archer and Francisco Bustamante are two of the game's greatest players, but they break using completely different styles. Look at a guy like Archer, who will throw his arm so far forward that it looks like he is about to touch the 1 ball. He lifts his back leg, pushing his whole body toward the cue ball. After cue-ball impact, the cue flies out of his bridge hand, so he finishes with his grip hand holding the cue high in the air (like in the photo on the left). But then there's a break like Bustamante's. He creates a powerful break without letting his cue out of either hand. He still uses his back leg to push his body forward, but Bustamante uses more of a hip movement. He is almost like a boxer throwing a punch. 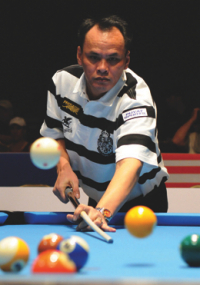 He stays compact during his break, throwing his hips into the cue ball. He keeps his cue on the table, and follows through in such a straight line, it's unbelievable. Try both methods, you'll find out which one works best for you. It might even be a combination of both. Just remember: Accuracy first, then power.